New York: My pick of the week is a spectacular yellow diamond cocktail ring by Swiss luxury jeweler, De Grisogono. Elite Traveler magazine lists the piece as the only one of its kind – a 45 carat Natural Fancy Intense Yellow diamond, set in yellow gold with yellow diamonds and emeralds. The value is of course listed as “price on request.” Judging by the number of times one sees these words with luxury collectibles, one wonders what they mean. Either the piece is really expensive or they’re going to try to guess how much you can afford. Makes the perfect buy for the woman who needs nothing but wants the extraordinary! 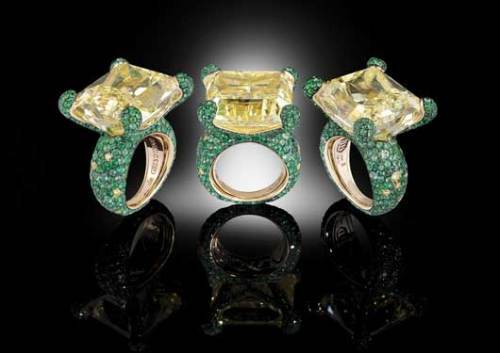 De Grisogono was established by Fawaz Gruosi in 1993. 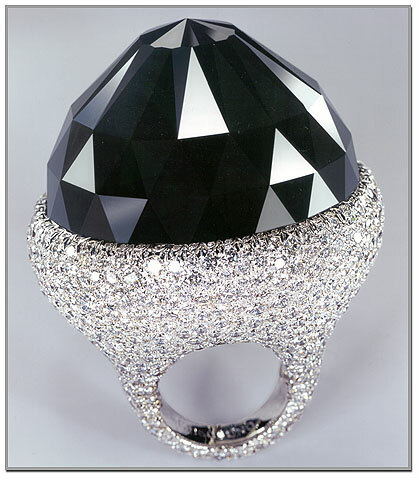 Gruosi is best known as a black diamond specialist and specifically for the Spirit of de Grisogon, the world’s largest cut black diamond and the world’s fifth largest diamond overall. With an original uncut weight of 587 carats (117 g), the gem was taken from its origin in West-Central Africa and cut by the Swiss jeweler. The resulting Moghul-cut diamond weighs 312.24 carats (62.45 g) and is set in a white gold mounting with 702 smaller white diamonds totaling 36.69 carats. Read more on other famous diamonds.